The Best of Teacher Entrepreneurs II: Interactive Journal for Students with Different Abilities! Interactive Journal for Students with Different Abilities! I have just finished a HUGE product that I am SO excited to share with fellow teachers and parents both! I was reading “Teaching Reading to Children With Down Syndrome” by Patricia Logan Oelwein and decided to make a full color Interactive Notebook based on her research and ideas, while integrating my professional experience. This project is 223 pages long, so instead of overwhelming you with all of the features of this notebook, I am going to provide highlights throughout the next few weeks. First of all, I would like to preface with the fact that I have an 11 year old son with Down Syndrome. I also have a Master's Degree in K-12 Adaptive Special Education. I also am an autism specialist trained in Applied Behavioral Analysis. My son is very resistant to doing anything that might possibly fall into the category of "homework." We have looked into ever single possible reason for this problem. We have tried Gluten Free diets, we have spent thousands of dollars taking him to sleep specialists thinking that he was just too tired after a day at school. He does have sleep apnea and sleep onset insomnia and we are treating that with a bi-pap machine. Still, there is no desire to do homework of any kind. EVER. As a teacher, I understand and completely respect the continuity and consistency between school and home. I have wanted nothing more than to reinforce what school was doing at home. I have such an added benefit that I work at the same school that my son attends and eat lunch with his SPED teacher and his SLP every single day. They are wonderful ladies whom I consider dear friends. However, my son just didn't understand why I felt that was important. I tried to reinforce at home and all I got was behaviors and refusals. It was negatively impacting our mother-son relationship and was causing a strain in our home so we took some time off. I felt guilty. I felt like a hypocrite for not following through with what I felt deep in my soul was the right thing to do for my son. I started playing around with Teachers Pay Teachers this year. I decided to polish up some of the things I have made for my classroom and post them for sale. My students gave my products rave reviews so I thought I'd play around with some products to support my own kids. We have all had fun with this whole process. Several weeks ago, I started working on this Interactive Notebook project for my son. He has consistently struggled with phonemic awareness and phonics skills. It is so hard for him to understand that the symbols on the page represent a sound, but depending on the symbols around it, the sound that particular symbol makes could change. Clearly, he's not alone in that struggle. I have read extensively on this topic but just a few weeks ago started building a product that applied these readings. 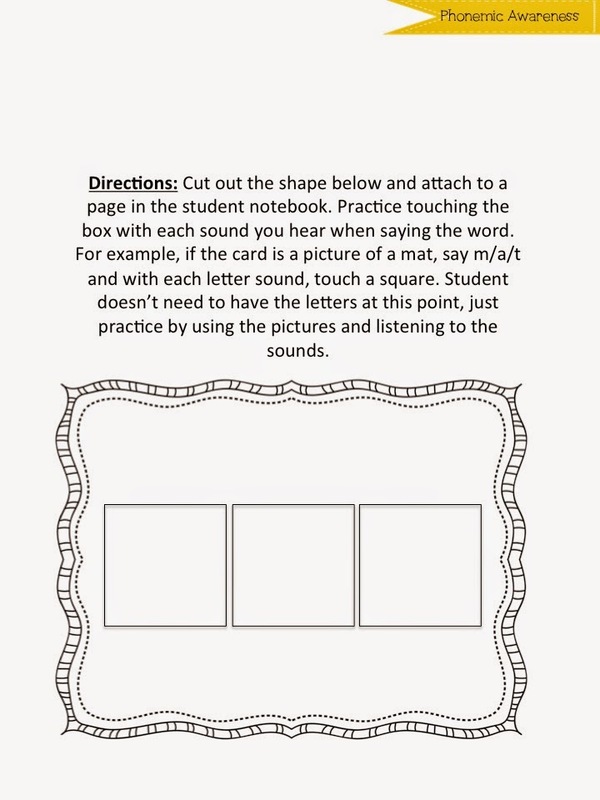 Before a student can apply the skills of phonics, they need to be able to understand that multiple sounds put together make meaningful words. It works best for me if I provide my son with a "forced choice." I give him 2-3 cards and he picks the one he wants to sound out. For example, if he picked "bed," we would practice listening to the sounds in the word, /b/e/d/ and touch each square with each wound. He picks the picture, therefore has ownership over the project. However, I only provided options that also worked for me, hence the term "forced choice." There is a separate page for each short vowel sound, allowing for many practice sessions. Right now, I have a little boy begging to do his work. I'm going to help him work, rather than stare at my computer screen in disbelief! 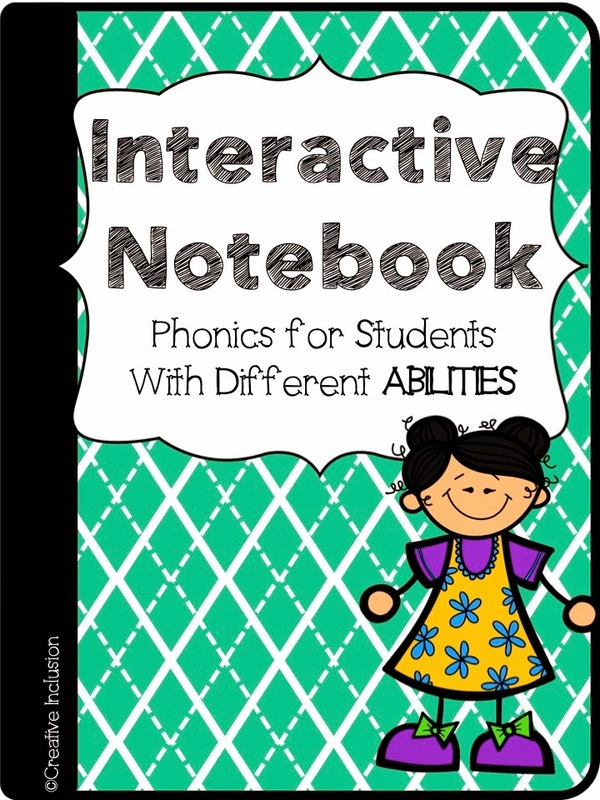 Interactive Notebook for Students with Different ABILITIES!